A red cotton baby dress looks crisp and fresh in the summer but can also be worn into the fall and Christmas season with a few adjustments. The main challenge will be in choosing which type of cotton and what style of red dress you'd like your baby girl to wear. When it comes to fabric, all cotton is not the same. Organic cotton is often used in baby clothes as it is thought to be softer than other types of cotton. Experts disagree as to whether organic cotton is actually softer or is just woven a bit finer, making it softer. Either way, it won't chafe baby's tender skin. Organic cotton is also grown in a way that is meant to protect the environment for future generations, so you'll be giving back to your baby by making the world a little greener, too. Keep in mind that a sundress can only be worn during the summer, while a baby doll dress with fluffy cap sleeves can be worn into the fall and winter. 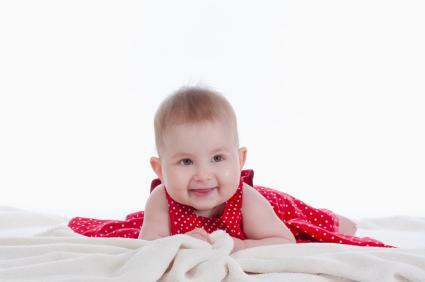 A red cotton jumper can be paired with a white blouse during cooler weather, assuming the dress still fits your baby. Even if the dress doesn't fit the baby it was purchased for, you may have another child that is that size during a different season. Keep in mind versatility while shopping for a dress style. When it comes to shopping for red cotton baby dresses, many stores carry such dresses. Just about any big box retailer, such as Walmart or Target, will offer red cotton baby dresses during summer, fall and winter. During the spring, the stores come to life with Easter pastels and white, so you may have a harder time finding a red baby dress at that time. Whether you are shopping in the spring or you simply want a bigger selection, here are a few online sources where you can get a red cotton baby dress year round. Grammie's Attic has a nice selection of cute red cotton dresses for babies, but this red sailor dress is almost too cute for words. Tiny Tot Dress Shop has clothing for infants on up through toddlers. You'll find a cute red gingham dress and a red jumper with puppies romping over the skirt. If you can't find the exact red baby dress that you have pictured in your mind, you can always use a pattern and sew one of your own. You will find an excellent selection of red cotton fabrics at your local fabric store or through sites like Jo-Ann Fabric and Fabric Depot. Simply search for the color red and then narrow your results from there based on the other details you want. In order to choose the perfect dress for your baby, think about the different occasions you might want her to wear the dress. If you plan to use the dress for some formal baby photographs, then you may want a dress that includes more ruffles and lace. On the other hand, if you simply want something cute for her to wear to the family reunion, a simple red sundress may be all you need. You may just decide that you need more than just one red dress and purchase two or three.